Isabel Bloom was gracious and graceful, imaginative and intense, a truly original woman who lived by her own advice, "…know what you want and follow it." Her life was one of intense creativity. It ranged from her natural artistic ability, to her creation of original artworks and a successful sculpture business while raising a family, to over sixty years of active interest in and support of the Quad Cities art community. Her belief that art should have a heartfelt, honest quality that she defined as "soul," was reflected in both her own sculpture and in the artworks that she collected. Throughout her 93 years, Isabel's blue eyes sparkled while her soft laughter punctuated stories of her family and her travels. She composed sculptures in her head from things she saw or remembered, enjoying the imaginative process that was an inherent, significant part of her life. It is a testimony to her optimism, curiosity and perseverance that throughout her life she said, "I never looked back, I am always pushing forward." Born February 20, 1908 in Galveston, Texas to Charles and Adeline Scherer. The following year her family, which included brother George and sister Mildred, moved to Davenport, Iowa, where her father became vice president and general manager of Davenport Machine and Foundry. Always a curious and creative child, Isabel began modeling with clay on a picnic where, along with her brother, she made small animals out of mud dug from a creek. The children took the figures home and baked them in a tin can in the family's coal furnace. When her father found their tin can and inadvertently dumped them into the ashes, it was reportedly the only time that Charles Scherer did not support his daughter's artistic endeavors. At the age of thirteen, Isabel's parents enrolled her in the Immaculate Conception Academy, a Catholic girl's school in Davenport. After graduating in 1926, Isabel briefly studied painting at the Art Institute of Chicago. Taught to sew as a young girl by a German neighbor, Isabel also studied at the Vogue School of Fashion, where she developed a love for dress designing. Returning to Davenport, Isabel taught for Singer and opened her own dress design business in the Kresge Building. She specialized in creating upscale women's clothing from beautiful fabrics. Often it was the fabric itself, unusual or exotic, which inspired her designs. Eventually Isabel realized that if she were to be a successful fashion designer she would have to relocate to a metropolitan area, something that did not appeal to her. She closed her shop, found a job as a doctor's receptionist and concentrated on her passion for art. In 1932, while visiting the Davenport Municipal Art Gallery (now the Davenport Museum of Art) Isabel picked up a handout, a simple act that would greatly impact her life both artistically and personally. The pamphlet, The Aim of the Colony, was advertising a summer art colony in Stone City, Iowa. Classes were offered in a variety of subjects including figure drawing, landscape painting and sculpture. Tuition, room and board for the six-week term cost approximately one hundred dollars. In 1932, over 90 students lived communally in Stone City. The women, who made up one third of the students, were housed on the third floor of the “Green Mansion” and the men stayed in converted ice wagons. The colony brought life to Stone City, once a thriving town dependent on its limestone quarries; it was nearly abandoned after the invention of Portland cement. The colony held Saturday night dances and Sunday chicken dinners. Artwork would be critiqued every Saturday and an art sale held each Sunday in the town’s opera house/hotel. Admission to the sale was ten cents and the average price for paintings was fifteen dollars. The colony, which received favorable press from Time magazine and several major newspapers, was described as a unique and refreshing event in American art. While it was an artistic and educational success, it was a financial failure. For that reason, the colony was active for only two summers, closing after the 1933 term. She saved money from her $15-per-week job to pay for the art colony tuition. She studied painting, composition and sculpture. The sculpture instructor was Florence Sprague, a professor at Drake University in Des Moines and the only female instructor at the colony. She would lead students to the Stone City quarries where they would pick out stones for their carving. It was an open studio class, with help and instruction if requested, but no required assignments or projects. Isabel recalled that she worked on simple sculptures of animals, especially rabbits. Students would work on their paintings and sculptures in a variety of locations, mostly outdoors. Isabel first met John Bloom, the man who would later become her husband, while she was at Stone City. John, an accomplished artist from Dewitt, Iowa, had been invited by Grant Wood to attend the art colony. Unable to afford the tuition, John was offered free tuition and room and board, in exchange for his work as groundskeeper. It was while performing this job that he met Isabel. She was carving a sculpture on the porch of the Green Mansion when he stopped to teasingly complain about the mess she was making and that he would have to clean up. Although they would not marry until several years later, both John and Isabel remembered the summer of 1932 as being very special. Isabel described her feelings about the art colony by comparing them to the way some people feel about being at the 1969 music festival Woodstock. The art colony fostered an atmosphere that made everyone want to work. Grant Wood, who never pushed his ideas, set the overall tone of the colony. The following summer, both Isabel Scherer and John Bloom anxiously returned to Stone City, but it was not the same. The communal ‘family of artists' feeling was gone, as Grant Wood was often absent. Inspired by her experiences at Stone City, Isabel continued to work on her art while employed as a receptionist at the L.W. Ramsey Co, a Davenport advertising agency. Meanwhile, John worked as an artist teaching at the Art Institute of Chicago, assisting Grant Wood on mural commissions at Iowa State University, and completing his own murals, including one in his hometown of Dewitt, Iowa. Through the 1930s Isabel and John kept in close touch through letters and visits. Isabel remembers a time when another artist expressed an interest in her, and John advised him to "leave Isabel alone. I am going to marry her." Eventually John moved to Davenport and the couple was married in 1938. The Blooms lived on the second floor of the old Davenport Masonic Lodge. They divided much of their living space into two studios. When their family grew to include three sons, Jerry, Tom and Charlie, John went to work as an industrial designer. In the early 1940s they bought their first Davenport home, on a bluff near the Centennial Bridge, which commanded a beautiful view of the Mississippi River. The large home had been boarded up for years and the two artists set about renovating the structure. They had ample room for their active boys and their studios, with John's being on the second floor of the house and Isabel's in the former kitchen in the basement. She often remarked that with the walkout basement's large picture window she could watch her boys play in the back yard. During the mid-1930s, Isabel took classes in ceramics and within a short time began teaching. She bought a kiln and had it installed in her studio. She experimented with mixing her own glazes and developed a mold making process. With ceramics, Isabel could either make hand-built, one-of-a-kind, or cast multiple sculptures from clay originals. The subjects of Isabel's early works ranged from animals and children, to whimsical figures of mermaids, to strong portrayals of women. Her interest in different cultures and her experimentation with glazes contributed to her choice of subjects. Isabel particularly admired Japanese prints and paintings and their frequent and beautiful depiction of fish. Recognizing the artistic potential, Isabel painted them onto dishes, sculpted their curving forms, and layered green, blue, pink and brown glazes onto her many fish sculptures. 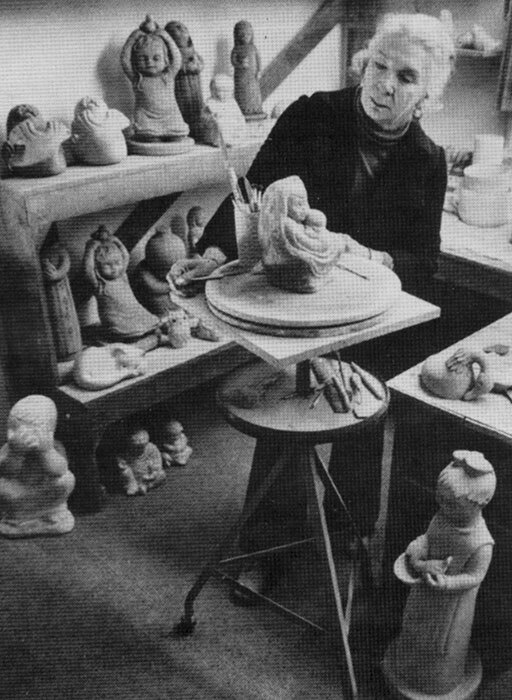 In the 1940s and 1950s, Isabel received several awards for her ceramics. One work that she was particularly proud of featured two children riding a carousel horse. Titled Merry-Go-Round, she donated it to the Davenport Municipal Art Gallery in 1953. The following year, her ceramic tile design Nativity received the award for the most outstanding work in the Quad City Artists Exhibition. She also had solo exhibits at the South Bend Indiana Art Association, the Rock Island Library and the Davenport Municipal Art Gallery. As early as 1940, Isabel and John had several exhibitions together which featured her sculptures and his paintings and woodcarvings. In 1957 Isabel was a founding member of Studio 15, named for the number of artists in the original group. The members exhibited their work, held open houses and enjoyed the social interaction with each other. Isabel maintained contact with the group, exhibiting sculpture at an honorary "Founder's Exhibit" in 1990. The Blooms had a long association with Davenport Municipal Art Gallery. Beginning in 1929, the Gallery held an annual Quad City Art Show, inviting area artists to exhibit their work and compete for monetary prizes. John and Isabel Bloom were perennial entrants and frequent award winners from the 1930s to the 1980s. Isabel also participated in the volunteer organizations of the Art Gallery, serving as an officer on the Tri-City Art League (which became The Friends of Art) and the Beaux-Arts Committee, teaching classes and hosting exhibit receptions. A charismatic personality and childlike enthusiasm about art made her a popular entertainer. She organized and taught art classes for the Davenport Park Board and the Adult Education program in Rock Island, Illinois. Her "Story Time" programs at the Davenport Public Library were particularly popular. In 1953 she was featured on a locally produced television show called "Let's Look at Art." Isabel's appearance on "Let's Look at Art" led the station's program director to ask her to develop a children's art program. 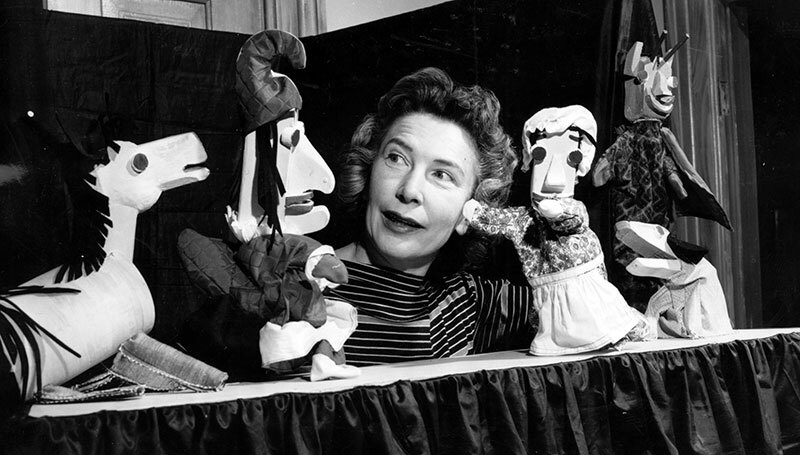 She combined her interests in children, teaching art and working with clay to create and host "Let's Make-Believe," which ran on WOC-TV in Davenport from 1953 to 1957. Make believe it's true, and it could be… Make believe it's true and we'll have lots of fun… Make believe it's true, because this is what I'm going to do… Make clay; tell a story, for you. In each show, Isabel would tell a story or a fairy tale, illustrating it with painted background scenes and clay characters that she had designed. She also used artifacts from local museums that would relate to the day's story. For example, she showed and explained Native American peace pipes and pottery to complement her telling of the poem "Hiawatha." She concluded each program with an art lesson. Often she would have children, including her three sons, on the set listening to the story and completing the activity with her. As the show was produced live, Isabel sometimes had unexpected situations, as when the eggs she had prepared for an Easter egg decorating lesson were eaten by her sons. Her salary for preparing and presenting the show was $15 per week. The children were her biggest fans, addressing their letters to "Dear Clay Lady." But Isabel did not limit her audience to children, saying, "I often suggest that my program is planned for those from 3 to 93 who enjoy making a mud pie." An extremely popular program, "Let's Make Believe" was praised by TV Guide in 1953 as a "refreshing approach to creative entertainment." During the late 1940s and 1950s, Isabel began experimenting with a new direction in her art. A friend, who was a landscape architect, suggested she look at garden sculpture. This was a field that had long been neglected, resulting in the extreme examples of Italian marble fountains, cast iron lawn jockeys and concrete gnomes. Isabel admired Victorian era bronze garden sculptures, with their rich green oxidized patina, and wanted to replicate that surface in a less expensive, but sturdy medium. Concrete, or cast stone, turned out to be that medium as it was inexpensive, readily available, weather-resistant, and could be modeled or cast in common with the clay that she worked with. The technique that Isabel devised for sculpting with wet cement is called ‘direct concrete'. Designing and constructing direct cement sculptures allowed Isabel to create more complex and open forms. Her playful sculptures of clowns, acrobats and harlequins and her warm sculptures of mothers and children used lots of interlocking forms and negative spaces within the sculptures. The method involves constructing a metal armature onto which thick wet concrete is added, like clay, in layers to build up a form. Isabel also included other materials under the layers of colored concrete, such as fabric and even plastic, to help in creating the shapes of the figures and the drape of their clothing. She experimented with different combinations of lime, cement, sand, granite dust and vermiculite to come up with the best mixtures for each stage of the sculpting process. Wet cloths and plastic bags were used to cure the sculpture after each layer was applied and kept the cement from cracking or hardening too fast. Blue, green and red dyes were added to the cement and applied in patterns or all over a specific sculpture. Isabel used rasps and stone cutting tools to shape the hardened concrete. One of Isabel's favorite direct concrete sculptures was entitled 3 Clowns-A-Clowning. Entered in the 8th annual Own Your Own - Sales Exhibition at the Denver Art Museum in 1964, it won an award and was sold. She later remarked, "That was the goal of every young artist, to sell their work to people who appreciate it." The attention and popularity of her award-winning sculptures resulted in Isabel being offered several public commissions. From the late 1950s through the 1970s she completed numerous commissions including one for the Bettendorf (Iowa) Library. This sculpture includes two life-size figures, a mother reading to a child, that weighs 400 and 150 pounds respectively. Designed in 1961, the figures were included in the building plans of architect Gerald Cox, who was a fan of Isabel's artwork and later commissioned her to sculpt a direct concrete "portrait" of his children. Isabel, who had a special gift for designing memorial sculptures, created meaningful, warm designs. In 1971 she was commissioned to create a statue in honor of Letha Davidson who had been a librarian at the Ames (Iowa) Public Library from 1929 to 1963. Ms. Davidson's main interests were encouraging children to read and increasing the children's collection at the library. Isabel created a figure of a young girl reading a book. Having recently returned from a trip to Russia where she studied mosaics, Isabel was inspired to include colorful blue and yellow glass tiles to the surface of the girl's dress. Another major commission included a large figure of a mother with two children for the Moline Lutheran Hospital that was originally part of a large fountain. The sculpture is currently found on the Mother/Child unit of Trinity Medical Center, West Campus, in Rock Island, Illinois. The nature of cast concrete made it necessary for Isabel to simplify her sculptures in order to reproduce them in cast concrete. She experimented with cement, adding dyes, vermiculite, sand and other materials in varying amounts until arriving at the perfect "recipe." She added an extra step to the casting process to accommodate the new material, making a latex mold of the original sculpture to be supported by the hard plaster "mother" molds. Through trial and error, Isabel learned the limitations and advantages of working with cement and the reusable molds she made herself. Isabel worked out of her basement studio for several years, using a mortar box and hoe to mix the cement by hand. Recycled coffee cans were used to hold small molds while the sculptures dried. Some of the first concrete pieces, which include Violet and Hugging Children, were cast in the gray color of the powdered cement. Two of these cement sculptures, Snowball Boy and Girl with Rabbit, were included in the Davenport Municipal Art Gallery's 1957 exhibit, Grant Wood and the American Scene. This exhibit featured works by Wood and a number of area artists who studied at the Stone City Art Colony. Also included in the exhibit were John Bloom's Rooster woodcarving and his painting entitled, The Operation. After months of trying different techniques, Isabel perfected the system for producing her sculptures. In order to resemble the bronze and green shades of Victorian sculpture, she used dyes to make the cast sculpture a brown, or bronze color. She developed the technique of "greening' by mixing blue and green dyes with water and fine white powdered cement to make a mixture that could be applied with brushes and rubbed off to reveal the color of the brown cast surface. She also used red dyes to produce terra cotta colored sculptures. The next step in the process was "whiting." Isabel would brush or wipe on and sponge off white cement so it remained only in specific areas. This was necessary to accentuate the lines and details of the original design. Intending the sculptures to be placed outside in a garden, she added a coating of clear resin to protect the surface from weather. Isabel realized that one advantage of working with cement was the ease in which foreign objects could be incorporated into her designs. Like the ceramic and glass mosaics of Italian, Spanish and Russian architecture, many of her sculptures were accented with colorful additions of stones, tiles and glass. These objects were applied to the cast figures with grout, a thick mixture of cement, sand and vermiculite. Smaller stones and glass were added into specific sockets and holes during the whiting process. Although Isabel bought tiles and glass "jewels" from suppliers, she found many of the stones at local quarries or when hiking by the Mississippi River. She made glass eyes in her ceramic kiln, melting fragments of car windshields and beer bottles to make blue and brown eyes. She also added brass rods to sculptures, small thin rods for the antennae on the Snail and larger rods for the legs on the Shorebird with Legs. To further individualize her sculptures, Isabel also experimented with adding yellow, green, orange and blue dyes to specific areas of some designs. Rubbing the dye into the chest area of a bird or fish sculpture during the greening process produced a subtle variation of color; painting the dye onto an area in a pattern resulted in a more dramatic effect. These variations, combined with the distinctively simple designs are what made Isabel's sculptures truly unique. Today, Isabel Bloom sculptures are easily recognizable. Their simple style and rounded features set them apart from the detailed, realistic sculptures of many other artists. When she began her art career, Regionalism was the popular style of the day. Regionalism reportedly grew out of a patriotic isolationistic reaction to World War I. Artists turned to subjects that were familiar to them, the local American landscape and the people around them. The works they created were realistic, but stylized, and Grant Wood's American Gothic made him the most famous proponent of his day. Growing up in the Midwest and being a student at the Stone City Art Colony helped to shape Isabel's style. The subjects she often chose to depict, children, animals and mother/child motifs, revealed the things that were important to her. Her three children were the main inspiration for much of her art and she sought to capture their natural gestures and quick still moments. Her ideas for sculptures often came from everyday life; a shy child at the supermarket became Peek; a small boy in swimming trunks at Lake McBride became Bending Boy. She also absorbed images in her travels to Europe, Russia and the Mediterranean. A young Greek girl wearing a kerchief became Seated Joy, and Joy's sweet face appears on many of Isabel's girls. The Bloom family cat inspired several of Isabel's works. Her love of animals is also evident in the gentle and sometimes humorous depiction of wide-eyed frogs and inquisitive squirrels. The Shorebird sculpture designs came from her memories of Florida where she and John, who was employed by the Rock Island Arsenal facility as an industrial designer, lived for several months during World War II. The spontaneous, natural forms of Isabel's sculptures come directly from her technique of sculpting from observation and memory. Many traditional sculptors study anatomy and use live models and drawings to aid in the design process. Largely self-taught, Isabel preferred to use her memory, an occasional sketch, and her own judgment of what "looks right". She even remarked that studying anatomy might hamper her work, as she was concerned not with the details of a specific subject, but the emotion and memory of a moment. Isabel often started working on a sculpture without knowing its final form, letting the design develop while her hands manipulated the clay. She enjoyed exaggerating the roundness of her figures. She repeated the curved lines of Violet's eyes in the folds of her skirt and the scalloped edges of her hair. Making designs look easy, Isabel captured the essence of a sleeping kitten with three lines and five circles in Small Cat. Although her modeled sculptures are not intricate, Isabel smoothed and simplified the designs even more when she reproduced figures in ceramic or concrete. Because she cast and finished her own sculptures, she designed for that process, knowing that the figures should be rounded and not angular, simple and not detailed. Beginning in the 1950s, Isabel sold her reproduction sculptures through a number of different outlets including a New York City garden design studio. The Laura Musser Gallery in Muscatine, Iowa (now the Muscatine Art Center) sold over 100 of her sculptures and Isabel named her Laura with Bird and Laura with Rabbit in honor of the gallery. The Davenport Municipal Art Gallery bought her direct cement sculpture Girl with Cat for its permanent collection and sold her sculptures in their museum shop. In 1961, she was also invited to place her sculptures in the annual Chicago Spring Flower Show, where she continued to exhibit throughout the 1960s. Isabel would call on wholesalers with a sample of her sculpture, usually a small bird, and photographs of her other works. One often repeated story tells about Isabel calling at the Chicago garden gallery of "Hoops on Michigan Avenue." The senior owner suggested she talk to his son who, on seeing Isabel's designs, exclaimed, "Where have you been! We have been looking for someone like you for ages." By the early 1960s, demand for Isabel's sculptures was outgrowing her workspace. When the Bloom family moved to the East Village of Davenport in 1963, she rented space for a studio in an abandoned ice cream factory on Mound Street. In 1966, Isabel's father Charles Scherer bought the building next door. Always one of Isabel's biggest supporters he, along with John, built shelves and benches for the studio and devised machinery (mixers and vibrating tables) to help with the production process. Isabel described her father as being "creative in a mechanical way." Isabel worked at the studio while her three boys were at school and posted a sign on the door, "Open by Chance or Appointment." She developed a loyal group of customers who bought sculptures for their own gardens, as well as gifts for others. She kept a limited number of items in stock, with many customers ordering pieces from her book of designs. She displayed the sculptures in the small front room of the studio along with primitives, driftwood and plants. She often used some of her personal sculptures as accents, including the plaster bust of her sister, Mildred, and a self-portrait cast in plaster and featuring a green patina. Throughout the 1960s and 1970s, Isabel added designs to her line of cast sculptures while completing several commissions for one-of-a-kind works. Occasionally she would transpose features or whole subjects from her direct cement sculptures to her cast sculptures. The face and hair of the Girl with Book became the head of Laura with Rabbit. Isabel envisioned her garden sculpture business as a way for more people to own art at an affordable price. Cast reproductions are less expensive than original artworks, so without taking away from the value of the direct cement Girl with Cat, Isabel created a smaller version to be cast in cement. She also occasionally reproduced John Bloom's woodcarvings in concrete, using the same finishing process. Their sculptures complement each other, having simplicity in common and a nice contrast of texture due to the difference in the original materials. In 1974, Isabel hired an assistant Patrick McCluskey. For the next five years he worked beside Isabel, remarking that she made everything look "effortless." The studio was now open from 10 am-2 pm, with orders filled on a weekly basis. Isabel and Pat would pour the cast on Monday afternoons, the cement mixer holding enough cement for three large and 30 to 40 small and medium sculptures. Isabel would finish sculptures during studio hours, stopping to socialize with customers. Pat recalls her gracefully switching from the heavy labor of finishing concrete figures to congenially greeting and assisting customers. She especially enjoyed it when children came into the studio. It was known by many that she would sell sculptures to children around Mother's Day, charging them only the change they had in their pockets. Isabel often created sculptures for specific events, to be sold to benefit special interest groups. One of her earliest charity sculptures was Teddybears, made for the Bettendorf Children's Museum. She designed the bears to resemble the Museum's mascots, two bears named "Bill and Joe" after the founders William and Joseph Bettendorf. Other designs included a bust of D.D. Palmer, for the Palmer College of Chiropractic and a museum fish, which was given to every new member of the Putnam Museum during their 1980 membership drive. From 1974 to 1978, Isabel added approximately 25 new designs to her collection. Numerous requests by customers for smaller indoor pieces gradually changed her collection from being primarily garden sculptures to more individual gift items. Popularity and demand increased every year; by 1979 it was necessary for her to hire additional employees. For three years the business continued with Isabel and Patrick McCluskey, Dennis Ricketts, Angela Hayman and Ann Kellenberger. She described them as young, artistically talented people, who she encouraged to be creative and to experiment with her techniques and methods. At the age of 73, and after the premature death of her son Charlie, Isabel decided it was time to sell the business. Several factors contributed to her decision, including the fact that the commercial side of the business was taking more of her time and energy than she was willing to give to it. For several years, Patsy Emmer and Sally Schell had ordered a large number of sculptures from Isabel, driven to her studio to pick them up, and then sold them out of their homes in Edina, Minnesota. In the spring of 1981 when they picked up their order, Isabel discussed with them the possibility of buying her business. Very interested, but not wanting to move to the area, Patsy and Sally contacted two local friends, Barbara VanVooren and Bernadette Murphy, and the four women bought the business as equal partners. The new owners of Isabel Bloom Ltd. wanted to ensure that Isabel's sculpture would be available for future generations to purchase and enjoy. Bernadette Murphy, from Moline, Illinois, and Barbara VanVooren, from Davenport, would manage the East Village studio including the production of the sculptures, while Patsy Emmer and Sally Schell would open a shop in Edina, Minnesota to be supplied with sculptures from Davenport. Three additional workers were hired, including Donna Liston (now Donna Young), who would eventually become the solo designer for Isabel Bloom Ltd. By increasing the number of employees and managers in the studio, the company accomplished their goal of having more sculptures in stock. Previously the studio had taken orders for large sculptures that often took months, and in the case of the Hilda fountain, over a year to complete. The owner-managers took a "hands-on" approach, carefully selecting and working alongside the artisans, building a family atmosphere within the company. Each day, the artisans would work as needed in all areas: making molds, casting, finishing and coating the sculptures, as well as helping in the salesroom. The owners and senior employees worked to fine-tune Isabel's techniques with more recent advances in the process. Finishing methods were modified to establish a more consistent appearance. Sculptures were still available in either the green/blue or terra cotta color, although the terra cotta color had evolved from Isabel's orange tint to a light rose shade. While the artisans could be creative in the placement and color of stones, by 1990 tiles were no longer used and glass eyes were limited to those with a light blue color. Carefully matching stones for eyes remained an important aspect of the finishing process. Bernadette and Barbara also started a number of events to recognize the staff, such as monthly birthday parties. The largest celebration was always reserved for February 20th, Isabel's birthday, when a party would be held for her in the studio. Isabel enjoyed speaking with the artisans about their own artwork and encouraging them to show her their drawings, paintings, sculpture or jewelry. Isabel's occasional presence in the studio invigorated this group of dedicated people who were continuing the unique business that she had started. Focusing on growth, the three business owners, Hunt Harris, Tom Carter and Jeff Gilfillan invested in the company by expanding its production and sales capabilities. In an effort to lower production costs in 2006, the decision was made to outsource production to China. In response to customer reaction, ownership rescinded the decision, producing only a small percentage of the line overseas to be sold to gift shops outside of the Quad City area. In 2010, the National Gift Line, produced overseas in cast stone resin and sold throughout the country, was discontinued. Selling the business that she began in her basement was a difficult decision for Isabel. She had succeeded in creating a distinct niche for herself and her artwork. But she also recognized that the business aspect of the Isabel Bloom studio needed full-time attention. She told Quad City Times reporter Julie Jenson that after the sale was completed, "We celebrated with champagne. I'm no bookkeeper or accountant and now I'm free to do what I want to do. I have a lot of ideas I want to start working on." Happy to get back to designing and working with clay, Isabel continued to create new sculptures for the company. Starting with the addition of the Baby Bunny, Wren, and Magpie in 1981, Isabel delivered new works each year for the next ten years. The release of new sculptures was often accompanied by promotional events. At these events customers could have an opportunity to meet and visit with Isabel, who would sign the first 100 sculptures personally. John Bloom also occasionally sculpted new designs for Isabel Bloom Ltd., such as Sniff in 1983 and John's Rabbit in 1988. 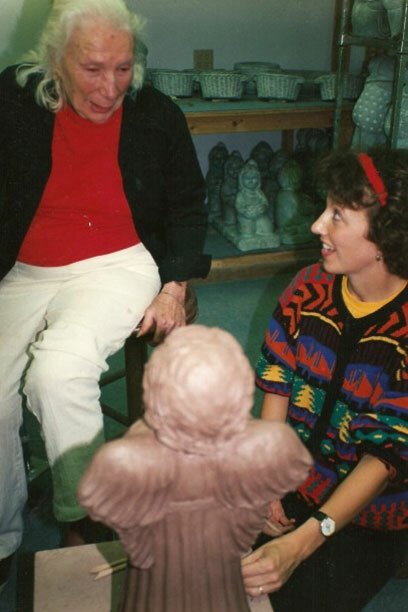 In addition, Bernadette and Barbara purchased many of the new direct concrete sculptures that Isabel created, including most of the harlequin series and some unique abstract works that she exhibited at the Davenport Museum of Art, the Clinton Art Association and Studio 15. Donna Young, one of several young artisans at Isabel Bloom Ltd., was often sent to Isabel's home to pick up the new clay designs. Having both an art background and experience in all aspects of the reproduction processes, Donna was an ideal choice to work with Isabel. As health problems, including open-heart surgery and Parkinson's disease, increasingly interrupted her work, Isabel would ask Donna to put the finishing touches on some of her clay models. "I know how difficult it is for an artist to turn over her unfinished work to someone else," said Donna. "Luckily, Isabel and I had a relationship of mutual trust and respect, which made it a little easier." Several of the sculptures that Isabel and Donna worked on together were Baby in a Basket, Boy Angel, Flower Angel, Doll Angel and Littlest Angel. From assisting Isabel, Donna began sculpting her own designs. In 1986, she completed her first original design for Isabel Bloom Ltd., Angel Plaque with Harp. As the number of sculptures designed by Isabel decreased, Donna's participation grew. She would often bring her clay models to Isabel to critique. Two sculptures that Isabel assisted Donna in designing are Nesting Birds Wreath (1993) and Garden Angel (1994). In 1995, Donna Young became the sole designer of Isabel Bloom Ltd.
Isabel continued to sculpt from memory and observation, inspired by ideas from friends, customers and charitable organizations. She often responded to requests for specific subjects such as Lion, designed for the Lion's Club in 1987. The requests sometimes amused her as when she learned several people were interested in adding an Isabel Bloom pig to their collections. The owners of Isabel Bloom Ltd. initiated the idea of sculpture series. In 1987 they introduced a series of Christmas Angels, which today is one of the company's most eagerly anticipated annual additions. The popular heart and egg series were both introduced in 1992, with Donna Young as the designer. The company continued Isabel's practice of creating new designs for specific events, and donating (or selling at a reduced price) a specific number of sculptures to charity. The bottom of these sculptures, signed with the initials of the organization or event, identify them as being part of a charity edition. One of these special sculptures was Symphony Girl, which benefited the Quad City Symphony Orchestra and commemorated its 75th Anniversary in 1989. That same year Isabel designed a wall plaque, depicting St. Luke the patron saint of physicians and surgeons, to benefit St. Luke's Hospital in Davenport where she had undergone open-heart surgery in 1987. In 1992, Donna Young began designing individual charity sculptures, including the Davenport House Plaque to benefit the Colonel Davenport House Foundation of Rock Island, Illinois and the Swing Plaques to benefit the Child Abuse Council of Moline, Illinois. Additional charity sculptures were designed to benefit organizations with which Isabel Bloom Ltd. had long-term relationships. This included several series of sculptures to benefit Quad City Arts through it Festival of Trees and another series of sculptures to benefit the Susan G. Komen Breast Cancer Foundation's local "Race for the Cure." Realizing the need to expand facilities to keep up with the demand, the owners decided it was time to find investors that could take the company into the new millennium. Advancing the sculpture business would require a great deal of business refinement and expertise. In August of 1995, three former executives of Star Forms Inc., a computer paper company based in Bettendorf Iowa purchased Isabel Bloom Ltd. Tom Carter, Jeff Gilfillan and Hunt Harris formed a partnership, bringing with them years of experience in administration, sales, marketing and systems analysis. The resulting company was known as Isabel Bloom LLC (Limited Liability Company). Continuing the legacy of Isabel Bloom is as important as anything we do at Isabel Bloom. "There are many factors involved for us, for our employees and for our customers that are tied to the traditions and heritage of Isabel Bloom and to tamper with them would be a kind of sacrilege," he said. "We would like to enhance, not change them." The finishing process that Isabel originated remains the hallmark of the sculpture line, with each piece individually handcrafted by skilled artisans. The hospitality of the staff mirrors the personal relationships that Isabel formed with her customers. The family culture of the company is enhanced by an open relationship between employees and management and increased opportunities for staff to grow professionally within the company. The practical goals of Isabel Bloom were to relocate the production departments of the company to a larger facility and to expand and update the existing studios. In 1996, casting, finishing, coating, shipping and the business offices were moved to a 19,000 square foot space in the Harborview building in Davenport, one mile west of the East Village store. The mold-making department remained in the East Village studio. Molds were transported to Harborview for the casting and finishing processes. The completed sculptures were then shipped directly to customers or transported to the sales studios. A major challenge for the new company was to have an adequate amount of stock available in the studios for immediate sale. Isabel's practice of taking orders in a spiral notebook was no longer suitable. Isabel Bloom Ltd. had attempted to keep a supply of sculptures in stock, by using a blackboard to keep track of weekly orders. Yet the demand had outgrown the ability of the company to supply their market. To meet this challenge Isabel Bloom made increased production a top priority. The larger space at Harborview allowed for the hiring and training of additional artisans. Between 1995 and 2001 the number of employees increased from 80 to 180. The production area encompassed some 60,000 square feet. In addition, the expanded casting area provided for the use of more molds, thereby increasing the number of sculptures produced. The studio showroom in the Olde Town neighborhood of Moline was remodeled in the spring of 1996. The appearance of the studios, which originated with Isabel's arrangement of the sculptures in a rustic setting, was replaced by a country style that featured the sculptures in home settings. The placement of a number of John Bloom's lithographs and paintings complemented the décor. Isabel's studio in the East Village was also remodeled and the showroom area was extended to five times its original size. The company's visual display coordinator would change the displays seasonally in all of the Isabel Bloom studios. The success of the Quad Cities stores encouraged the Isabel Bloom owners to consider additional studios. One was opened in 1996 in the Chicago suburb of Wilmette, Illinois and later relocated to the Riverwalk District of Naperville. In 1998 a studio was also opened in the Valley Junction area of West Des Moines. To maintain a visual presence of Isabel Bloom in all its studios, the company financed a limited edition bronze casting of the clay self-portrait that Isabel had cast in plaster in the 1950s. Five sculptures were cast, one was given to Isabel and the others are on display, one in each of the studios. In 1999, Isabel Bloom relocated their Moline studio to the John Deere Commons. A former factory building, the studio's larger showroom, more accessible location and convenient parking enhance the customer's shopping experience. The studio is a showplace, with a large salesroom filled with the sculptures, antiques and seasonal displays that emphasize Isabel's designs, as well as the sculptures of Donna Young. The working atmosphere at Isabel Bloom is open, casual, friendly, personable, comfortable and respectful. "All employees regardless of their level of responsibility are encouraged to share their ideas and concerns." Bloomers (as they refer to themselves) tend to stay with the company for many years. A commitment to promoting from within and providing opportunities for professional growth is evident in the number of department heads and managers who started out in positions requiring much less responsibility. The knowledge and experience of these longstanding employees contribute to the current success of the business. While Isabel's basic processes of "casting," "greening", "whiting" and "coating" remain virtually the same; many innovations have occurred through interaction between individual employees. In 1996, master mold maker Greg Gsell developed a process to make black eyes from a porcelain slip that is fired in handmade molds in the kiln. The uniform shape and color of the porcelain eyes provide a consistent appearance, while retaining the natural look of stones. Also in 1996, both greening and whiting finishers began to sign each sculpture with their initials. This practice of initialing pieces emphasizes the fact that each sculpture is handmade by individual artisans. The employees' appreciation for Isabel Bloom sculptures goes beyond artistry and dedication in the workplace. Many Bloomers are also loyal customers of the company, buying sculptures for gifts, as well as their own personal collections. This unique tie to the product makes employee-customers a valuable source of opinions and suggestions. Although Isabel Bloom sculptures are made using many of the same processes that Isabel developed, some changes have been made to improve the materials and to ensure a consistent quality of finish. From the beginning of casting through the completion of resin coating, each Isabel Bloom sculpture takes four to five days to complete. Trained artisans, who take pride in continuing the heritage of Isabel Bloom, shepherd each piece through the process that has eight basic steps. The first is the design phase. Donna chooses a subject, sometimes drawing a sketch or taking a photo of a model. She sculpts the model in clay, paying close attention to surface texture and proportion. After approval of the model, Donna takes her clay to the mold-maker. Brushing many thin layers of latex over the clay model, a process that takes three or four days, forms the first mold. This latex mold preserves every detail of the design, while being flexible and strong enough to withstand many pourings of concrete. When the latex is set, plaster is carefully hand-applied over the latex in sections, thus forming a firm support for the detailed inner mold. After the plaster has cured, the mold is separated into sections and the clay original is removed. A plaster replica is cast in this mold and inspected for defects. Then the latex and plaster parts are given corresponding numbers and this becomes the "master mold." Additional molds are made from the plaster replica. The completed molds are transported to the casting room where a mixture of cement, sand, water, rock and pigment is poured into the mold. The recipe varies according to the size of the sculptures being cast. The casters use vibrating tables, hand prodding and mold rotation to eliminate air bubbles and assure that the concrete mixture settles into every detail of the piece. Once they are set, the concrete casts are removed by separating the sections of the plaster molds and stripping off the latex molds. The casters then sand off rough edges. Small defects are fixed before finishing, and any piece with a large defect is destroyed. The remaining smaller sculptures are divided up among the finishers, while the large sculptures continue to cure. During the brown stage, river stones and tiles are applied to those sculptures that require them, this includes Large Owl and Quail. Finishers, chosen for their creativity and artistry, apply a grout mixture (cement, sand, vermiculite, pigment and water) to form a thick layer into which the stones or tiles are pressed. The sculptures then sit overnight to cure. The next step is the greening or "rosing" process. Each artisan mixes cement and pigment (color) according to a specified recipe. While the recipe is the same, the color can differ depending on the preference of the finisher. To bring out the rich undertones of the base sculpture, which has been water soaked, the colored cement is hand-applied and then carefully rubbed off in specific areas. This green-tinted finishing provides the distinctive appearance of weathered bronze. Green finishers are encouraged to bring out the strong bronze highlights reminiscent of the sculptures that Isabel finished. As each sculpture is completed, the finisher initials the bottom. Then the sculptures are sealed in plastic bags to cure overnight. The next day, a mixture of fine white cement and water is applied to the piece. The white finishers work carefully, using sponges to leave fine white lines in the detail of the design, while lightly frosting the rest of the sculpture. During this process, Mississippi River stones and porcelain or glass eyes are placed in the appropriate indentations. The artisans are free to be creative with the placement and selection of stones, as no two pieces are ever quite alike. When the whiting process is completed, the finisher initials the bottom of the sculpture next to the greener's initials. Finally, a clear resin is hand-applied to each sculpture, providing a slight sheen that adds reflective qualities, as well as surface protection. When dry, the sculpture is signed with the Isabel Bloom ® signature by artisans trained to replicate Isabel's handwriting. If the date of introduction of the sculpture occurred after 1985, the year of introduction followed by the copyright symbol © is also written on the bottom of the sculpture. Sculptures designed by John Bloom are also signed with a facsimile of his signature. Isabel Bloom sculptures are appropriate for a wide array of special occasions including birthdays, weddings, and anniversaries. They are often given to express friendship, support, sorrow, and love. Many individual sculpture collections are started by a gift from a friend or loved one. Collectors' range from children to great-grandparents and in many families, giving and receiving Isabel Bloom sculptures has become a tradition spanning generations. Customers often take sculptures on trips as gifts representative of the Quad Cities or our Midwest region. Likewise, many tourists to Iowa want to purchase a unique, locally made keepsake. "We are lucky to be an interwoven part of the local community and culture," said Tom Carter. "It is not just important for us to support the local community; it is vital for our continued success." To reinforce this concept, the company has introduced several sculptures that depict Quad Cities landmarks. The limited edition Eagle Plaque pictured the Centennial Bridge, over the Mississippi River, and the background of the Summer Days Plaque shows the I-74 Bridge connecting Moline, Illinois and Bettendorf, Iowa. Isabel Bloom is a prominent and well-known company. As a Quad Cities based business for over 50 years, the distinctive finish of the sculptures and the unique navy blue bags with their ribbons are easily recognizable. While the remodeled stores and charity participation also increases public exposure, customer "word of mouth" accounts for much of the interest that the company has attracted. "Our loyal customers are proud of their association with our product and company and feel a sense of community with us," said Jeff Gilfillan. The company communicates with its customers in a variety of ways including through their emails and seasonal flyers. Due to rising costs of printing and mailing, the catalog which over the years expanded from its original 12 page black and white pamphlet, introduced by Isabel Bloom Ltd., to over 40 pages of four-color photographs, is no longer produced. Since 1999 the entire line of sculptures can be viewed and purchased at www.ibloom.com. Isabel Bloom's marketing plan includes advertising, which often focuses on newly released sculptures. Local media promotions are also part of the plan and the company sponsors annual "Preview Parties" at all of their studio showrooms. These parties allow customers to meet Donna Young, preview new designs, and have their purchases signed by Donna. A toll-free customer service number was established in 1998. Calls are received in the Harborview building, where the finishing and shipping departments are located, ensuring the prompt filling of orders. The website, the toll free number, flyer mailings and email communications have made it more convenient for customers to purchase sculptures from any location and at any time. Isabel Bloom passed away in her home, near her husband, John, on Tuesday, May 1, 2001. She had battled Parkinson's disease for decades; it had confined her to a wheelchair and gradually limited the mobility in her hands. Her spirit, mind and artist's eye were present till the end as she continued to relate stories and watch spring come into bloom around her. The legacy that Isabel Bloom leaves is more than just her sculptures; it is seeing the beautiful details of the world and wanting to share that vision. It is accomplishing a goal, no matter what the obstacles; it is not even seeing the obstacles. It is plunging into new experiences without fear and adapting to the best of your ability. It is inspiring and touching people with kindness and integrity. Tom Carter, Jeff Gilfillan and Hunt Harris, the owners of Isabel Bloom spoke for all of us when they relayed the news of Isabel's passing to their employees. It is somewhat symbolic that Isabel left us on the first day of May. May Day is a time of rebirth. The warmth of this sunny day uplifts our hearts. Isabel's designs remind us of nature, children, flowers and all the creatures of Spring. While we are saddened by the loss of this great lady, all that is good around us reminds us of her art and her special character. The joy that Isabel saw around her will forever be with all who own her sculptures. Isabel led a full and varied life. Her creativity was our inspiration. While she has left us in body, she will always remain with us in spirit. The community will greatly miss this unique lady. As members of the company bearing her name, let us carry on her legacy of creativity and service. Let us all give thanks for this wonderful woman who touched our lives in so many ways. Donna Young has created a special sculpture, "Grasshopper," as a tribute to Isabel Bloom's ability to see and appreciate the beauty of small things, like the children and animals that inspired many of her designs. "Grasshopper," is mounted on the same Anamosa, Iowa limestone, which Isabel used to begin her sculpturing career at Grant Wood's Stone City Art Colony. Isabel was an artist and a teacher who taught us to discover simple beauty in all things. From the chubby, round shape of a child playing peek-a-boo to the elegance and grace of the grasshopper which one day landed on her hand, Isabel taught us, "Seek beauty in the ordinary. Never take any small thing for granted." Inspired throughout her artistic life by "watching the children", it is fitting that all proceeds from the sale of "Grasshopper", be used to enhance visual arts education within the school systems of Scott County, IA and Rock Island County, IL. The Isabel Bloom Art Education Fund, founded by Isabel Bloom, is administered by the Community Foundation of the Great River Bend and will provide annual grants to support visual arts programming that is outside traditional funding sources available to the schools. Tax-deductible contributions can also be made directly to the fund. In 2002, Isabel Bloom opened its production facility to the public, by offering free tours, which offered guests the opportunity to interact with the artisans as they demonstrate each step of the handcrafted process. In 2003 the first "tour sculpture" was introduced. "Isabel Rose", named in honor of our founder, was available in a special "multi-color" finish to tour guests only, and only for one year. This practice of introducing a limited edition tour piece would continue for many years. 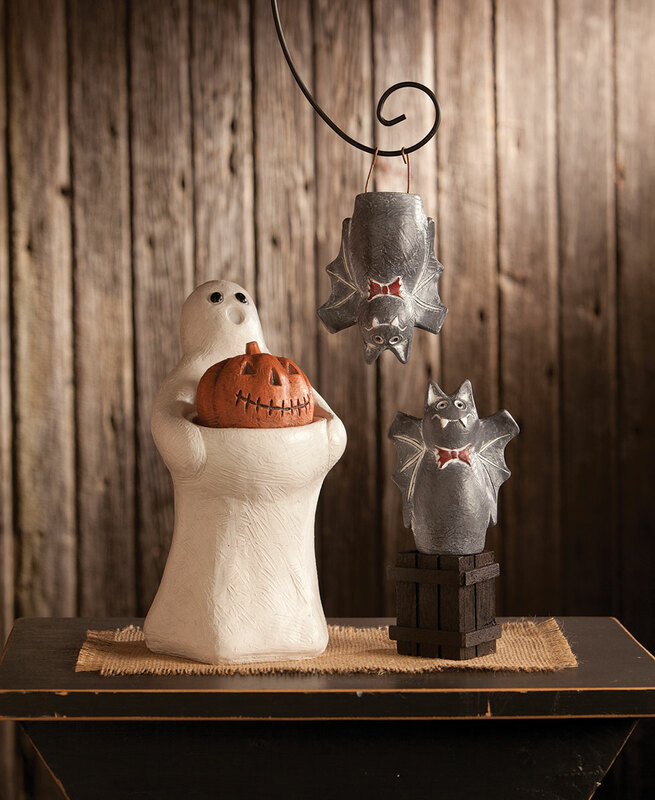 Halloween is a favorite holiday of Donna's, and in 2005 the company began a new Halloween series, with the introduction of "Boo", a simple ghost, holding a small tea light. This new design prompted some experimenting with casting in different colors, such as white, as well as applying different finishes on top, such as verdigris. In order to reduce the cost of creating an Isabel Bloom, the weathered bronze finish was eliminated, and sculptures were poured with a green concrete mix and then finished with white, thus eliminating a step in the finishing process. Many customers missed the weathered bronze patina, and it was brought back in 2009. Some sculptures are still finished in green. Continuing to focus on growth, the three business owners, Hunt Harris, Tom Carter and Jeff Gilfillan, in an effort to lower production costs in 2006, decided to outsource production to China. In response to negative customer reaction, ownership rescinded the decision, producing only a small percentage of the line overseas to be sold to gift shops outside of the Quad City area. Looking for a way to reward our best customers, the very popular "Hugs Rewards" program was developed in 2007. Customers could now earn a $15 credit for every $150 spent. Also this same year, a "Story Card" was developed for each sculpture in the line. These cards include the name of the sculpture, and a short, inspiration or poem, often written by Isabel Bloom employees themselves. These story cards add even more meaning to an already meaningful gift. In 2007, after 10 years in the community, the tough decision was made to close the showroom in Naperville, Illinois. Another new finish was developed in 2009, called Garden Moss Rose. The intent was to create a look of "aged" sculpture. The cast sculpture is first dipped in a bath of diluted muratic acid to "etch" the surface. Then diluted exterior moss-green paint is applied using a spray bottle. A darker brown-colored paint is then drizzled over the top of this. The result is a very appealing finish unique to Isabel Bloom. These Garden Moss Rose sculptures do not receive the final clear coat, as the intent is for them to have a rough, rather than glossy appearance. In 2010 the National Gift Line, produced overseas in cast stone resin and sold throughout the country, was discontinued. Also in 2010, the front room of the East Village store was remodeled, creating a historical tribute to Isabel. Many original one-of-a-kind ceramic and direct cement sculptures of Isabel's were brought together, as well as old newspaper clippings chronicling Isabel's artistic career. In 2011, Donna and 2 other long-time employees Cathy Nevins and Bill Barrett purchased the company from Hunt Harris. Isabel Bloom Inc was born. Under Cathy, Bill and Donna's leadership, Isabel Bloom's community involvement continues to strengthen in areas involving women, children and especially the arts. They are committed to keeping the integrity of the handcrafted sculptures as the 60 + year old company continues to thrive. In 2014 a new showroom was opened in LeClaire, Iowa; a picturesque town just 20 miles from the Quad Cities, along the banks of the Mississippi River. A year later, Isabel Bloom collaborated with American Picker's Mike Wolfe (who is from LeClaire, Iowa) to create a sculpture to bring awareness and support to "Operation Smile". Inspired by Mike's daughter, Charlie, who was born with a cleft lip and palette, the sculpture captures the innocence of childhood … while sharing the hope all parents have for their children's health and well-being. In December of 2015 a check of $10,000 was presented to Operation Smile. In the Fall of 2016 the opportunity for Isabel Bloom to bring its sales and production back together under one roof came about courtesy of the recent sale of the buildings at Harborview to local developer Joe Erenberger. Soon its retail showroom and mold-making will move one mile west to a more spacious location at 736 Federal Street (The Gordon-Van Tine Buildings formerly known as Harborview) in Davenport, where most of the company's handcrafted process already takes place. "We have searched for several years to find a way to combine our sales and production, so when the buildings at Harborview were purchased by Joe Erenberger and his partners, the possibility of bringing retail to our production site opened up," Bill Barrett, Co-Owner or the company said. Co-owner and sculptor Donna Young said the move returns the company to Isabel's original model. "Isabel originally had the entire handcrafted process and retail under one roof," co-owner and sculptor Donna Young said. "We artisans worked alongside one another as we crafted molds and casted and finished sculptures. When the showroom floor got busy, we would clean off our hands and go help out. We are returning to that model by bringing our mold-makers - along with our retail space – back together. It will offer our customers a more intimate, dynamic and exciting Isabel Bloom shopping experience, much like when I first started working for Isabel Bloom over 30 years ago." Extensive renovations to the newly renamed Gordon-Van Tine building at 736 Federal Street will accommodate the new Bloom retail and production space. They are expected to be completed by early October 2016. Donna Liston was born in 1959 in Council Bluffs, Iowa, the 3rd of 7 children. Her father was a hardworking man of many talents who spent most of his working days as a machinist for the Union Pacific Railroad, and his evenings and weekends working on the family cars, repairing things, and adding on new rooms as needed to accommodate the growing family. It could be argued that her mother worked even harder as a registered nurse, coming home from work every night, preparing a home-cooked meal for her large, ravenous family. The kitchen table played an important part in Donna's upbringing; it was here, elbow to elbow with her siblings, where her values were formed. It was also here where she developed her love of "making things" with her mom; from creating and arranging feather flowers, to gluing together glittery Styrofoam Christmas ornaments; her mother was always up on the latest and greatest craft and to Donna's delight would bring home all of the necessary supplies. Growing up in a small house with so many siblings, Donna treasured time spent alone or with her mom "making things" from found objects. All through school her favorite subject was Art. She was the go-to person when it came to creating posters for high school dances and other events. Donna's first sculpture experience was not unlike Isabel's, as far as the reaction from the family was concerned. Donna remembers asking her parents for a bar of Ivory soap to carve, and then proceeding to spend an entire evening at the kitchen table, working feverishly; carving the likeness of a pig. Once completed, she proudly presented her little pig to her father. Her father, having grown up during the depression, had learned not to waste anything, and the fact that the little pig was a mere fraction of the size of the original block, he felt that it was totally a waste of a good bar of soap. He sternly asked, "Where's the rest of it?" Like Isabel's father, her first attempt at sculpting failed to impress, but also like Isabel's father, her dad proceeded to show only support in his daughter's artistic endeavors going forward. When it came time to choose a college, Donna's parents' one restriction was that the school be in Iowa. She knew she wanted to study art at a small school and so, wanting to really "get-away" as most 17 year-olds do, Donna looked to the eastern edge of the state, as far from Council Bluffs as she could go, which led her to Davenport. The campus of St Ambrose College was the perfect size and seemed a great fit. Upon returning home after a campus visit, Donna wrote to the head of the Art Department, Father Catich, asking for more information. Little did she know of this world-renowned artist at the time. Later that year there came in the mail a beautiful hand-lettered Christmas card signed by Father Catich himself. This sealed the deal for Donna, and the next 4 years were spent studying Art at St Ambrose. In 1981, after graduating with a bachelor's degree in Art, Donna took a job as an assistant sign painter for a small sign shop in Bettendorf, Iowa. After several months on the job, a friend informed her that "Isabel Bloom" was hiring and convinced her to apply. (At age 73, Isabel had decided she'd had enough of the business side of things, and wanted only to go back to doing what she loved most, and that was sculpting. The new owners' first order of business was to hire a couple more artisans in order to catch up with the growing demand for Isabel's art.) On the day of the interview, Donna walked through the front door of the studio showroom for the first time at 1109 Mound, in the Village of East Davenport and was totally taken aback. It was a tiny showroom, filled with simple, rounded concrete figures all in the same soft green hue, propped up on wooden boxes, river stones, drift wood and various interesting antiques. The place could have used a good dusting, she noticed, but the thing that really caught her eye, and gave her the feeling that she would really like working here, was the telephone (yes, back in the day of the land lines, and rotary dial, no less!). It sat in the far corner of the room, just before an open doorway. It was not unusual at all to have a phone in your showroom. What was unusual was that the phone was covered in caked-on cement, and maybe a little plaster. To Donna this spoke volumes about what went on here. She liked the idea of getting her hands dirty, and of working with the customers. The interview went well and she was hired. Donna was one of only 5 employees for several years. Her first position was as a sculpture finisher, applying the white cement to the previously "greened" sculptures. Being such a small shop, it didn't take long to learn every step in the production process. As the company grew, Donna eventually landed in the mold making department. One of the coolest things about this job was receiving the new clays from Isabel. Even cooler, was getting to go to Isabel and John's home just up the road to pick them up! Donna so enjoyed her visits with Isabel and John, now both in their eighties, as they were very happy to receive visitors, and loved showing off their artwork collected during their long lives. As time went on, Donna and Isabel became good friends, Donna visiting many times, just because. Eventually, due to declining health, Isabel found it more difficult to do the fine sculpting on the detail of her sculpture. She would entrust the final touches to Donna, who eagerly accepted the job. The transition to Donna creating new sculptures was a gradual one, with both Isabel and John's encouragement, critiques and approval. Donna remembers many times struggling with a certain aspect of a design, taking it over to Isabel's and coming away knowing exactly what she needed to do. Donna's first sculpture for the company was called "Angel Plaque". Donna met her husband Jeff while studying Art at St Ambrose. Jeff, also an artist, owns and operates a local sign company, "Young Art & Sign". Together they have 3 grown children. Their daughter Emma currently works in mold making and sales for Isabel Bloom. Their middle child, Peter works with Jeff at the sign shop, and their oldest, Phil owns and operates Fleet Feet Sports, a running specialty store in Davenport. Phil and his wife Jackie have 2 children, Sydney and Ginny. Back to the Classroom; Donna's "Stone City"
Although Donna's first mentor was Isabel herself, through the years, Donna continued to study sculpture by attending week-long workshops taught by great sculptors throughout the country. She has traveled to Loveland Academy of Fine Arts in Loveland Colorado annually for years, studying with renowned sculptors such as Lincoln Fox, Rosalind Cook and Gary Price, until the tiny academy closed their doors for good. She then traveled to Scottsdale, Arizona to study with sculptor Simon Kogan, and later to Brookgreen Gardens in South Carolina to study with Garland Weeks. From each of these artists, Donna was inspired, learned new techniques, found new tools, and experimented with various clays. In 1996 Donna was commissioned by the Trinity Auxiliary to design a life-sized bronze sculpture for Trinity Hospital in Moline, Illinois. The auxiliary's dream was to provide a healing and unique piece of art that could be enjoyed by patients, family and the community. The sculpture, called "A Healing Touch," depicts a father and mother comforting a child. It is located on the 7th Street campus at John Deere Road, Moline. In 2001 Donna designed a special sculpture, "Grasshopper," to honor Isabel Bloom, who passed away that same year. "Grasshopper" was a tribute to Isabel's ability to see and appreciate the beauty of small things. From the chubby, round shape of a child playing peek-a-boo to the elegance and grace of the grasshopper which one day landed on her hand, Isabel taught us to seek beauty in the ordinary and to never take any small thing for granted. Proceeds from the sale of this sculpture were used to establish the Isabel Bloom Art Education Fund, which provides extra financial support to visual arts education in primary and secondary schools in Scott and Rock Island Counties. Donna sits on the board at the Community Foundation of the Great River Bend for this fund. Most of Donna's actual physical sculpting takes place in a spare room on the second floor of her home, overlooking her tree-shaded backyard. Because of this, her family members are the first to see her designs. In fact, rarely does Donna bring a sculpture in to ‘work' without her husband, Jeff and son Peter first signing off on it. Although sculpting only 2 days a week, in her mind Donna is always developing designs for future sculptures. At the office, she meets once a week with her product development, or "PD" team, as they refer to themselves. The four of them brainstorm ideas for future sculptures. Many ideas also come from family, friends and customers. The year 2011 was amazing for Donna. In January she traveled to Florence, Milan and Rome, Italy with an alumni group from St Ambrose. It was the trip of a life time for Donna as she soaked everything in; from the delicious coffee, wine and Italian dishes to the incredibly beautiful paintings, architecture and marble sculptures. Seeing Michelangelo's David was definitely the highlight of the trip. In October of that same year Donna and 2 long-time co-workers, Cathy Nevins and Bill Barrett purchased Isabel Bloom LLC from Hunt Harris and Isabel Bloom Inc was born. In 2013, as another way to honor the creative lives of John and Isabel Bloom, while giving Quad City kids and families a chance to immerse themselves in the arts, Donna organized the first "Village in Bloom" festival in the Village of East Davenport. Although bad weather that first year caused the festival to be postponed to the following day, it was well-attended and considered a success by the media, community and participants. At the free family festival each year, thousands of kids of all ages experience the inspiration, excitement and joy of making, seeing and hearing art. Donna hopes to continue to grow this festival into a major family event for the Quad City community for years to come. To her children she was a devoted mother who canned raspberries, sewed patches on the knees of their jeans, and planned family picnics. To her husband John she was a partner for over sixty years. To her contemporaries and friends she was often the life of the party. To the public she was an artist with a real knack for producing beautiful, unique sculptures. I cannot begin to effectively put into words what Isabel Bloom meant to me. When I first met her, she was already 73 years old. I've often dreamed of knowing her when she was my age. I doubt if I could have kept up with her. She was an artist I admired, yes, but she was so much more. She was a friend and teacher whom I looked up to not only as an artist, but also as a woman ahead of her time. When Isabel began her career, a woman's place was in the home, not the studio. She didn't know the meaning of the word "defeat" and her motto, "Know what you want, and follow it," sounded much easier to do than it was to live by. Isabel knew she could be both a good mother and a career artist. Throughout her life she seemed to combine the two parts beautifully and effortlessly. I will always remember the last time that Isabel and I went out together to an event. It was 1999 and we were attending the grand opening of our new showroom in Moline. A wide variety of people from the community were in attendance. Isabel, at 91 years of age, was in great form that evening. She was sitting in her wheelchair, surrounded by admiring fans. Some were having their picture taken with her, others asked her to sign their sculptures, and still others were sharing memories of purchasing a sculpture from Isabel back in the early days. She took it all in with her usual grace. Towards the end of the evening I could see that Isabel was tiring and I began pushing her wheelchair toward the door. As we approached the exit, the room grew quiet and then someone began to clap. As others joined in I turned the wheelchair around so Isabel could acknowledge the applause. She had touched the lives of everyone in the room and now they were giving her their sincerest thanks for the many gifts of beauty she has given to us. The outpouring of sentiment overwhelmed me and I know Isabel was deeply touched too. I believe this story gives insight into the woman and the artist, Isabel Bloom. But a person like Isabel cannot truly be summed up in a few thousand words. Her sculptures tell us more than any words can hope to do. For many years I have lived intimately with her designs and yet I am still learning from them. Isabel was a genius because she did so much with so little, while expressing a lot in a very simple and beautiful way. I will miss her more than words can say.